For more than 4,000 years, Feng Shui played an important part in Chinese culture, explaining how human affect by their habitats in a scientific and systematic manner. The study on the five elements of universe, namely metal, wood, water, fire and earth as well as polarities "Yin" and "Yeung" doesn't limited to the wisdom of living, but forming also the base theory for transcendentalism and the techniques of reading a person's fortune and character by one's date/time of birth, ID card number or even mobile phone number in use. The Chinese fortune teller will notice your ups and downs during different phrases in your life based on the revelations behind those numbers and their interaction with your five elements, telling people how to achieve harmony in daily lives that individual's health, wealth and auspiciousness can so be maximized. Master Eva Ko Man Hei is one of the most popular Feng Shui consultant and fortune teller in Hong Kong . She specialized not only in evaluating and optimizing people's living environment with her Feng Shui knowledge, but also renowned for realizing others fate accurately by integrating various ancient divination techniques with modern life-style taken into consideration. Outspoken, solid advices will then be given according to one's unique fortune and character so that people can react to effectively maximize their auspiciousness and minimize the damages from possible upcoming afflictions. Due to her accurate divine and serviceable advices, Master Ko is frequently invited by scalable real estate developers for Feng Shui advices on their projects. She also shows up regularly on major presses and electronic medias like TVB, Easy Finder, Jiu Jik, Cosmopolitan and Metro Radio to share her views on Feng Shui, transcendentalism or make divination for their audiences. 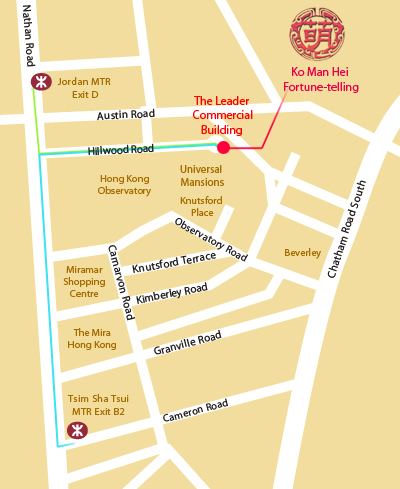 54-56 Hillwood Road, Tsim Sha Tsui, Kowloon, Hong Kong. For the oversea client, you can now make payment with your VISA, Master, AE and PAYPAL. Choose one thing to ask, for example, could buy this house? should change jobs? should break up? any third party and so on. . . . . . After payment, send your name, payment date and time and issues e-mail to [email protected], Eva will reply by e-mail. KO's Four Pillars Chart calculated to the status of each stage of your life to help you avoid danger, to make sensible way forward. After payment, send your name, payment date and time, date of birth, time and country of birth, e-mail to [email protected], we will then arrange online interviews by SKYPE.